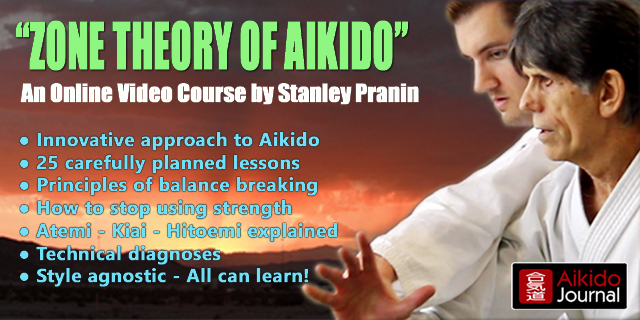 Hi, I’m Stanley Pranin here to tell you about my online video course, the “Zone Theory of Aikido”. You know I’ve been involved in Aikido for more than 50 years. To tell the truth, Aikido has been my life. I can’t think of a better discipline to train well-rounded, fit people with excellent self-defense skills. That being said, I believe we still have a long way to go to develop more refined teaching methodologies to accelerate students’ advancement in the art. What do I mean? Well, I travel frequently in Aikido circles and train with practitioners of many different styles. I’ve found similar training patterns regardless of the approach to Aikido. I consider one of the biggest hurdles to improving one’s skills is the almost universal tendency to resort to physical strength in attempting to make techniques work. When aikido practitioners get stuck, they tense up and try to force their way through the technique. I see this everywhere I go. For many years, I experienced the same thing in my own training. Only recently, have I been able to discover ways of using the body as a unified structure when applying techniques. What a difference this has made! This has been a liberating discovery that has allowed me to totally rethink my way of approaching the execution of techniques. My techniques work now, consistently, even against training partners of superior strength. This has never happened before! In the “Zone Theory of Aikido” video course consisting of 25 lessons, I’m going to walk you through this innovative approach to doing aikido. I will show you ways of using your body more efficiently. I will explain the importance of positioning, balance-breaking… how to use atemi, kiai, and O-Sensei’s hitoemi stance to give you a tremendous advantage in practice. I look forward to sharing this whole new world of training principles and strategies with you. Hi, i woud like to know if this course could work for beginners who has some experience in judô (Orange belt) and ukemis. Please have a look at the video excerpts we are providing. You’ll be able to see actual portions of the course and can make an informed decision. This looks like something sorely needed in the Aikido world here in the US. i woud like to know if the course has English subtitles. Yes, it does. Please watch the videos here and you will see how the course is organized and presented. Hi, I’d like to know if you think hapkido and jiujitsu practitioners might benefit as well from this course. Perhaps so. We have included a detailed description and presented many videos taken directly from the “Zone Theory of Aikido” course. I believe there is enough information for each individual to make an informed decision. Great sensei, i learn Aikido fron an informal teaching (not in formal Dojo) but i learned a lot about its techniques, and you add more of it as i observe you in your demonstrations. Zone theory? Look at what Nishio Sensei did. It’s called irimi.. You are welcome to sweden and practice for Shishiya Sensei, Pranin-san 🙂 there we have soft techniques that works really well with effective atemi(Sensei has throught his career tested his skills against budokas, it’s the only way to test if the techniques are effective or not). When watching videos across the spectrum, I am constantly amazed at how many practitioners and teachers alike attempt to apply techniques on a “balanced” uke. Another way of expressing this is that nage has failed to disrupt uke’s posture before attempting a throw. This is especially obvious when uke takes a spectacular fall. An uke whose body structure has been broken will not have the chance to perform an acrobatic fall. Add your comments to the discussion!.. 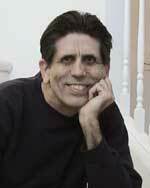 I am 66 years old and have physical limits that would not allow me to take falls and be thrown. I have a great interest to learn aikido. What would be best way to learn and practice Aikido. Is this even possible?